The Hour I First Believed deals with many themes: violence, family, the quest for meaning and connection, faith, and the power of chaos to change our lives. These themes are stitched together by two opposing emotional states—despair and hope. How are these two oppositional states intertwined in the story? How are they demonstrated in the story? Use any of the character's lives as an example. Do you believe that out of chaos—tragedy—comes understanding and hope? Is this always the case? Can perpetrators of chaos be victims themselves? Which, if any of the characters, demonstrate this? If you answer no, why not? One of the major themes of the book is violence. Can violence ever be justified? Is it sometimes necessary? Think about the sacrifices of Caelum's ancestors who gave their lives to free the slaves and save the Union. Or those who have lost their lives in other conflicts. Is war always immoral? Scientists say we all have the capability of violence. What stops some from hurting others? What might propel the unassuming to commit a tragic act? How is this evident in the novel? Discuss the main characters. What were your impressions of Caelum and Maureen? Of Velvet? What about the real-life perpetrators of Columbine, Eric and Dylan? Did your impressions of these characters change over the course of the novel? If so, why? How does Caelum and Maureen's relationship evolve from the beginning of the story to its conclusion? Why did they stay together? Would either have been justified in divorcing the other? If they had separated, what might have happened to them? Why does Velvet call Maureen Mom? What is their relationship? Why do you think they were able to form such a powerful bond? What did each give to the other? What is Velvet's relationship to Caelum? Why does he find it so difficult to sympathize with the girl when she is his student? How does the arrival of Katrina survivors Janis and Moze affect Caelum's life? What does their appearance add to the story? Velvet tells Caelum that she Googled his name and discovered it was a constellation. According to Webster's Dictionary, a constellation is "a group of stars forming a recognizable pattern that is traditionally named after its apparent form or identified with a mythological figure; a group or cluster of related things." Does the novel's main character embody this definition? How so? Do you think Caelum could have found his hour of belief without the events he experienced? Do you think he could have learned to believe without discovering the stories of his parents, his aunt, and other family members who went before him? What does the title The Hour I First Believed mean to you? Have you had a moment of belief or witnessed it in another's life? In the afterword, Wally Lamb writes, "I placed my fictional protagonist inside a confounding nonfictional maze and challenged him to locate, at its center, the monsters he would need to confront and the means by which he might save himself and others. Along the way to discovering Caelum Quirk's story, I, too, wandered down corridors baffling and unfamiliar." Did reading the novel take you to unexpected places or raise unfamiliar feelings? Explain. Caelum's aunt, Lolly, lived by the philosophy of the sign that hung behind her desk at the prison: "A woman who surrenders her freedom need not surrender her dignity." What did that mean to Lolly? What does that mean to you? Did Maureen find freedom in her imprisonment? The novel recalls the debate of nature versus nurture. How much are we the sum of our families? How much can we change? Fate and free will also play a role throughout the novel. How are the two connected? How are fate and free will related to nature and nurture? In his community college class, Caelum asks his students to relate the Greek myths to their own lives. In reading their responses to his question, which, if any resonate with your own life? Throughout the novel, Wally Lamb interweaves numerous calamities that have befallen our country, from school violence to Hurricane Katrina to the Iraq War, that have touched all of us to some degree. Can you find hope in any of these dramas? If so, what? We live in a society that believes more in punishment and retribution than in rehabilitation when it comes to the incarcerated—a far different view than that held by Caelum's aunt, Lolly, a correctional officer at a successful women's prison before she was forced into retirement. Do you believe in rehabilitation? Do you think kindness is important even when it comes to criminals? Why or why not? Wally Lamb has worked within the prison system, using his gifts to reach out and help inmates. Have your views of crime, prison, and criminals changed in any way from your reading of the novel? One critic called Wally Lamb a "modern-day Dostoyevsky," whose characters struggle not only with their respective pasts, but with a "mocking, sadistic God" in whom they don't believe but to whom they turn, nevertheless, in times of trouble (New York Times). Do you think this describes The Hour I First Believed? 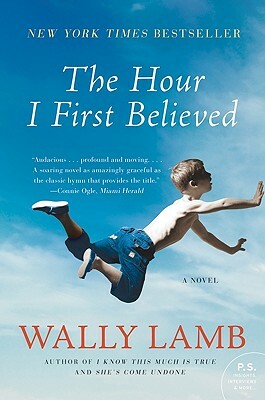 If you've read Wally Lamb's previous novels, compare and contrast them with The Hour I First Believed. If you've read the autobiographical essays written by the women in Wally Lamb's York Prison workshop (Couldn't Keep It To Myself, I'll Fly Away), would you say that Lamb's work with these students informed the plot of The Hour I First Believed? If so, in what ways? The Hour I First Believed interfaces fictional characters with actual people who are alive today and people from the historical past. Did you enjoy this technique or not? Is it fair or unfair to blend fiction and nonfiction? Was it fair of Lamb to draw on the actual Columbine tragedy, or should he have created a fictional school shooting incident?